"Anything Goes" is a popular song written by Cole Porter for his musical Anything Goes (1934). Many of the lyrics feature humorous (but dated) references to various figures of scandal and gossip in Depression-era high society. For example, one couplet refers to Sam Goldwyn's notorious box-office failure Nana, which featured a star, Anna Sten, whose English was incomprehensible except to Goldwyn, who came from the same part of Europe. Other 1930s society references include film producer Max Gordon, socialite Evalyn Walsh McLean and her highly promoted trip to the Soviet Union, interior design pioneer Lady Mendl's scandalous predilection for performing hand stands and cartwheels in public at the age of 70, and the financial woes common to "old money" families during the Depression, such as the Vanderbilts, Rockefellers and Whitneys. Most modern versions omit these lyrics, replacing them instead with generic examples of social upheaval. 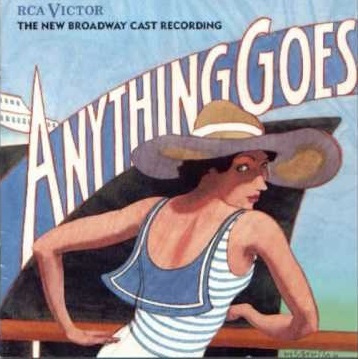 Anything Goes is a musical with music and lyrics by Cole Porter. The original book was a collaborative effort by Guy Bolton and P.G. Wodehouse, heavily revised by the team of Howard Lindsay and Russel Crouse. The story concerns madcap antics aboard an ocean liner bound from New York to London. Billy Crocker is a stowaway in love with heiress Hope Harcourt, who is engaged to Lord Evelyn Oakleigh. Nightclub singer Reno Sweeney and Public Enemy #13 Moonface Martin aid Billy in his quest to win Hope. The musical introduced such songs as "Anything Goes", "You're the Top", and "I Get a Kick Out of You." Cole Albert Porter (June 9, 1891 – October 15, 1964) was an American composer and songwriter. Born to a wealthy family in Indiana, he defied the wishes of his domineering grandfather and took up music as a profession. Classically trained, he was drawn towards musical theatre. After a slow start, he began to achieve success in the 1920s, and by the 1930s he was one of the major songwriters for the Broadway musical stage. Unlike many successful Broadway composers, Porter wrote the lyrics as well as the music for his songs. Dogs eating. LMAO or LMFAO? I almost cried!